These stations of the cross were written at the request of Goodsoil.org, who posted them on their website during Lent of 2005. Then Pilate saw that he was making no impression, that in fact a riot was imminent. So he took some water, washed his hands in front of the crowd and said, 'I am innocent of this one's blood. It is your concern.' And all the people shouted back, 'His blood be on us and on our children!' Then Pilate release Barabbas for them, and ordered Jesus to be first scourged and then handed over to be crucified. Last weekend we visited friends who have a country home up in Sebastopol. It is beautiful countryside, with an early California spring bringing out buds, flowers, and promise. My friends have installed the Stations of the Cross at the periphery of their property, so one can wander through the blackberries, apple trees, roses, and quail, and remember the passion. It is a bit disconcerting to wander up to an oak tree full of buds and nascent leaves, and see the plaque noting the condemnation of Jesus. I began to think, that all of us are similarly condemned ­ condemned in the midst of goodness and beauty ­ condemned as babies, really. Jesus is condemned for our sakes, and we are condemned because of him. Our condemnation, flowing out of Adam and Eve's weakness, is transfigured into a different kind of condemnation. We are condemned to be buried with Christ in baptism ­ and to arise as a new creature ­ a new person. This is not unfamiliar business to GLBT people ­ who live simultaneously in the midst of condemnation and resurrection. The problem is to get our selves and others to see the resurrection part. This is not a resurrection that abandons all God has made us to be, but rather a resurrection that integrates all of life, again, and makes it whole. Death among the budsit is an apt symbol of our lives and journey. O Jesus, you died that I might live. Let me die to those things that separate me from you and others, and let me rise to a life that will be a springtime for others. Let us live in you. Amen. The governor's soldiers took Jesus with them into the Praetorium and collected the whole cohort. Then they stripped Jesus and made him wear a scarlet cloak, and having twisted some thorns into a crown, they put this on his head and placed a reed in his right hand. To make fun of him they knelt and said, 'Hail, Ruler of the Jews!' And they spat on Jesus and took the reed and struck him on the head with it. And when they had finished making fun, they took off the cloak and dressed Jesus in his own clothes and led him away to be crucified. What crosses have been given to you in your lifetime? What crosses have you willingly taken? In our language about Jesus going "as a lamb to the slaughter" we run the risk of setting aside the human aspects of this drama. Is Jesus given the cross here, or does he take it? To know the inner psychology of the moment may not be ours to have, but we can approach the moment. I didn't choose to be a gay man, nor did I always willingly accept that. It surprises me to think that so many in our churches think that gay and lesbian people actually sit down a make a choice of it. We may choose to come out, but the realities of our orientation are often borne by us at an early age. Is this a cross handed to us, or is it a cross that we willingly take up. Nor are gay and lesbian people the only ones to wrestle with such life dilemmas ­ others have equally wrenching decisions. We don't know what Jesus' thoughts were at the moment, we only know the action. Jesus takes up the cross (later to give it up for a moment). In this action Jesus takes up the cross so that there might be life. We too often have to take up the difficult so that others and we might have life as well. Even this distinct act of Jesus is so touched with humanity, that it becomes a model for our own living. O God in heaven, Jesus Christ still carries the cross in your persecuted brothers and sisters throughout the world. Make us feel the needs of all persons so that we might as readily help them as we would help Jesus. Amen. If the world hates you, know that it has hated me before you. If you were of the world, the world would love what is its own. Because you are not of the world, but I have chosen you out of the world, therefore the world hates you. Remember the word that I have spoken to you: No servant is greater than the master. If they have persecuted me, they will persecute you also. I am attending an Episcopal Church in San Francisco that has learned how to fall. It has had a proud history, has had clergy who have advanced a great number of social issues, was on the forefront of grappling with and dealing with AIDS, and now it has fallen. I don't know if it is the first, second, or third time that this church has fallen, but it has the grace to know that it is down. What I find attractive about this congregation is its struggle to begin to know itself again. It is anxious not about the loss of prestige and history, so much, as it is anxious to regain a ministry in its neighborhood. From this fallen position it looks up and out and asks, "What shall we do for others? Whom shall we invite in?" That Jesus should fall is not only a storyteller's tool to make us understand the severity of his suffering, but also presents a Jesus who confronts suffering and failure as any human being would. He has fallen, and in that fallen state we recognize our failures as well. There is no need to look beyond this ­ it is enough for us to meditate on being fallen, on thinking it out in faith, on waiting on God or others, on grasping on to hope. Jesus will get up (only to fall again), as we will get up, as this church will get up. But let us take a moment, while we're all down on the ground, church, Jesus, you and I, and let us wait a moment, and pray. It might be a time for waiting. O God, comfort us and give us peace when we call to you; turn the anxiety of our sins into the joy of forgiveness, and in your goodness, hasten the return of Jesus Christ. Amen. Now there were standing by the cross of Jesus, his mother and his mother's sister, Mary of Cleophas, and Mary Magdalene. When Jesus, therefore, saw his mother and the disciple standing by, whom Jesus loved, Jesus said to his mother, 'Woman, behold your son.' Then Jesus said to the disciple, 'Behold your mother.' And from that hour the disciple took her into his home. A Catholic audience would get this station. Those of us who follow in the traditions of Luther have lost it, and the other Protestants have been alienated from it. There is something profound in the interchange between Jesus, Mary, and John. Jesus, in a way, is stirring up the pot; much in the same way as when he asked, "Who is my mother, who is my father?" The traditional relationships were blown away in the new age that he was ushering in. In that context, this little saying has great power. And it is not a power that exists in that one moment, that one instance. It is a power that needs to be reclaimed. "Jesus said to his mother, 'Woman, behold your son.'" Poor Mary, none of the usual family relationships seemed to exist for her. The usual explanations simply did not obtain in her situation. She must have lived at some distance from neighbors and even from family. She surely lived in the midst of a people who simply could not our would not understand. Some of us know what that is like. To this faithful servant, to this wonderful mother, Jesus says, "Woman, behold your son." Jesus gives to Mary a new family, a new relation ship, and a new kinship. Now it is every disciple, every beloved one of Jesus who is the relation, the kin, the tribe, the family. Worthy of ponder! Likewise, John ­ the beloved, is given a new relationship, "Behold your mother". Jesus says this to John, but he in effect says it to the entire Church ­ Behold your mother! It is the genius of classic Christianity, in both the East and in the West, that the ubiquitous patriarchy that suppresses so much in the development of Christianity, allows this one fundamental woman to stand ­ the Mother of God, and indeed, here, the mother of us all. Luther put it best: "Mary is the Mother of Jesus and the Mother of us all. If Christ be ours . . . all that he has must be ours and his Mother also must be ours." O blessed Jesus, at your passion a sword of sorrow pierced the loving heart of your mother as Simeon had foretold. Grant that we who look back on her sorrows with compassion might receive the healing fruits of your sufferings. Amen. On their way out, they came across someone from Cyrene, Simon by name, and enlisted him to carry Jesus' cross. When they had reached a place called Golgotha, that is the place of the skull, they gave Jesus wine to drink mixed with gall, which Jesus tasted but refused to drink. Who carries your cross? 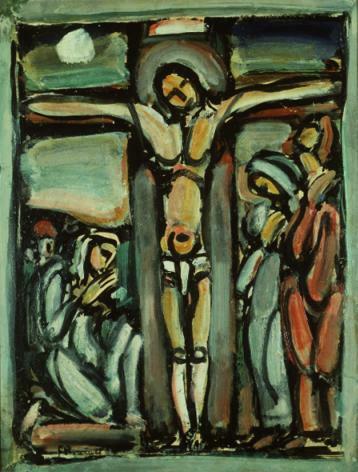 In the Passion, it is not Jesus who requests that Simon carry his cross ­ "they enlisted him". It is, when you think about it, an amazing glimpse of mercy on the part of someone, that Jesus should be given this respite from his suffering. Or perhaps it was not mercy at all, but sheer practicality and efficiency that motivated them to draft Simon to carry the cross. Who carries your cross? There are others who choose to carry our loads. I recently made a trip to Denver, Colorado to bury my Aunt Louise. My mother and one of my sisters accompanied me. It was not a happy time ­ another aunt, unhappy that I was no longer in a more conservative Lutheran Church, and equally unhappy that I was so out about my homosexuality would not allow a hymn I had written to be sung at my aunt's funeral, nor would she allow me to serve in any capacity at the ceremony. In spite of my older aunt's explicit wishes ­ written down for her survivors to see ­ that this hymn among others should be sung, the directive was ignored. The next day, at coffee, I discovered how hurt and angry my mother was. I, who had been told by her that we would disagree about gay issues, suddenly realized that she had been carrying my cross for a long time ­ in spite of her difficulties with my life. She took it up freely and boldly. I am no victim, such as our Lord was. I do, however, like all of you, have things that I bear in silence. My mother was suddenly my Simon, and my load was equally lightened. What a blessing! Lord Jesus Christ, help us to see in the sufferings and shortcomings of our lives a share in your cross; strengthen and console us in the belief that we bear all things in union with you, who have taken upon yourself even our guilt. Amen. This is such a wonderful legend-story in the Stations of the Cross. Veronica seeks to honor and serve Jesus by wiping his sweaty and bloody brow, as Jesus makes his way to Calvary. The piece of cloth that Veronica uses to wipe Jesus' brow is soon imprinted with his image ­ a prequel to that other cloth in Turin! So who and what is Veronica? Is she only a lucky follower who ends up with a souvenir following her attendance at the events of the Passion? Or, is she the image herself? Once while walking in a Palm Sunday Procession around the gritty block that holds St. Francis Church, another member walking with me commented that this action didn't seem to have the spiritual punch that he had expected. "Seeing all these cigarette butts and pieces of newspaper scattered on the street doesn't make for good liturgy," he said. I reminded him that the disciples kicked at the first century equivalent of cigarette butts and newspapers as they made their way. It is the ordinary character of things that surround our life in Christ that makes the whole experience extraordinary. So back to Veronica ­ wiping the face of a condemned criminal. Was it only Jesus' face that she wiped? Where the others treated to the same consideration? And the image on the cloth ­ was that the miracle? Or is the miracle that this simple woman embodied, indeed became the image, of the Christ who anoints all with mercy and healing. This ordinary act of kindness is transmogrified into a veritable icon of Christ's holiness and service. Holy Veronica, lead us to serve as well! Almighty and ever-loving God, we feel your love and understanding in the consolation and support we receive from one another. Give us, we ask you, the courage and dedication to sacrifice and suffer with those who are in need, the least of your people. Amen. that justice may be brought to the nations. or roar aloud in the street. nor the wavering flame quenched. for the islands are awaiting God's law. The anonymous soul who pulled the materials together for this liturgical exercise of the Stations of the Cross understood humanity, and in that understanding of humanity had a profound glimpse of godliness. When you read the ancient myths you are struck by the human qualities of the Greek and Sumerian goddesses and gods. Hungry, petty, egoistic, pouting, these figures for all that the ancient world wanted to control and understand were notable in their similarity to us. In our rush to understand Jesus, we have either painted him in the guise of our next-door neighbor and buddy, or we've painted him as the sovereign of heaven, the Pantocrator, the creator and ruler of all. Now, in this buddy-hero we suddenly see the one who has fallen ­ again. It is not the princely ruler or the friendly companion that we see, but a fallen man. It is a tonic to our overly friendly, or our overly other Jesus. Jesus is the fallen one ­ and we're not even at the cross yet. If this indeed is an icon of Jesus that gets us in touch with heavenly realities then it may make us think again about the men who beg at the highway intersections, or the woman who waits (for what?) at the corner of Van Ness and Golden Gate Avenue. They are fallen ones ­ how are they like the Christ? How do they remind us of the Christ? How are we fallen ­ and what is our spiritual failure? The Jesus who falls may touch us more deeply that the Jesus who rises. The Jesus who falls lives in the center of our own failures, and our own risings. O Jesus Christ, you shared in our weaknesses and accepted our guilt. Grant us the favor of rejoicing over our human weaknesses, so that in all we do, your strength, dwelling in us, may be shown to all others. Amen. Large numbers of people followed Jesus, and women too, who mourned and lamented. But Jesus turned to them and said, 'Daughters of Jerusalem, do not weep for me; weep rather for yourselves and for your children. For the days will surely come when people will say, "Happy are those who are barren, the wombs that have never borne, the breasts that have never sucked!" Then they will begin to say to the mountains, "Fall on us!" to the hills, "Cover us!" For if green wood is used like this, what will happen when it is dry?" These women were doing the socially appropriate thing. In advance of the actual death, they mourned for Jesus. They did what was expected, and it is always at that human junction that Jesus pokes through to the root of things and radicalizes the situation. "Don't weep for meweep for yourselves!" The death of Jesus is an icon for many things. Our theology of cross and sacrifice have taken away other messages that the cross and passion may still have for us. Jesus' comment to the women is the comment of a person who truly understands the world. It is not cynicism that drives this comment, but a clear understanding of the pervasiveness of evil or disorder in our world. Our own Gordian knot is the complex situation that our history, greed, religion, and economy have created. Good, innocent, and fine people are slaughtered every day, and good, innocent, and fine people become the unwitting agents for the slaughter. Jesus reminds us not to worry about him ­ by rather to worry about our own kind. The situation is so dire that the urge to propagate the species may even be abandoned. For what ought we weep in our culture and in our lives? What in our Lent has distracted us from the suffering of the world, from the misery of the peoples, from the death of thousands? The women at this station were doing the liturgically correct thing. Jesus asks them to look at themselves, and the situation in which they live. "Now weep!" he says. Beloved Jesus, with tears of pity these women of Jerusalem responded to you, broken bruised and beaten, on the road to Calvary. Deepen our faith, we beg you, so that we may see you in our brothers and sisters, bruised by our envy, beaten down by injustice, and broken by our greed and our indifference. Amen. strengthen me with your words. At one point in my life, I had gone down to Washington DC to speak with my bishop. I had just gone through a divorce, was dealing with my own sexuality, was having a great deal of difficulty relating to my parishioners in south New Jersey, and I wanted out. "It builds character!" the bishop said as I left his office, not receiving the move that I had hoped for. I sought solace in a bar at Dupont Circle ­ but others saw through me and were put off by my essential sadness. I tried to call friends. Peter was out of town. David was at a meeting. Barton was working. Lonely and afraid, I went to my car on the mall, got in, put the key in the ignition and began to weep ­ deeply weep. I had fallen for the third time! A therapist once said to me that such profound grief and sorrow was of benefit. It was important to touch the deepest parts of our failure and sorrow. Jesus falls the third time. This should leave no doubt in our minds of the depth and suffering of this man. Isaiah understood this situation, "someone of sorrows and acquainted with grief; and as one from whom others hide their faces this one was despised, and we esteemed this one not." This is not, I think, a part of the substitutionary punishment, but rather Jesus deeply knowing the world for which he would soon be the sacrifice. This day, know your sorrow and grief as a place from which wisdom, understanding, and salvation can spring. Like Jesus we may fall, but like Jesus we shall risebecome new. Almighty God, Jesus our Savior suffered at human hands and endured the shame of the cross. Grant that we may walk in the way of the cross and find it the way of life and peace; through Jesus Christ. Amen. and upon my garments they cast lots." Remember the poor widow of whom Jesus makes an example when the disciples see her giving a meager offering in the temple. Jesus praises her for she gave her all as an offering. It is this sense of offering all that ought to capture our imagination as we observe this station. Cynics will look at the action of the officers dividing the garment, as a psychological game; a placing of Jesus into a position of shame and humiliation. Remember, these are the same ones who offered Jesus the false dignity of the purple robe and the crown of thorns. Jesus gives all of this up: pride, dignity, stature, modesty ­ it is all given up and more. The officers overseeing the crucifixion divide Jesus garment. In St. John's Gospel, this garment is described as being of one piece, "woven from top to bottom." Therefore they cast lots, so that they wouldn't have to divide it, thus destroying its value. It was probably the one thing of value that Jesus has ­ and it is given up. Jesus saw in the widow what he was soon to do. From this position of shame, humiliation, and defeat, Jesus reigns. The sign that Pilate has posted above his head makes the point, but with tongue in cheek. Jesus is the ruler and sovereign, whether naked on the cross, kneeling at this disciples feet, or born of the Virgin. Whatever dignities that were granted him are passed to others. Now I wonder, what must I pass on, or give up, to reclaim my dignity? O Jesus Christ, stripped of everything, you stood exposed to the jeers and contempt of the people whom you loved. Clothe us with genuine love of others, so that nothing we suffer may ever fill our hearts with hatred or bitterness. Amen. In some churches, during the Eucharistic Prayer, just after the consecration of the elements, each of them are lifted up (at the Elevation) and bells are rung. Why? To capture us and to bring us from what ever prayers, and praise, or more mundane things have arrested us during this prayer and to concentrate our minds on this one point in time and space ­ to make us aware of Christ's presence with us in the Eucharist. The Lord of all who is "with us always until the end of the age" is now here, or there, or there. At this point we can touch, take and receive, and envelop the living Christ. Please don't think me ludicrous or comic by noting that the soldiers nailing Jesus on the cross and then raising him up, function almost as priests ­ raising up the crucified Christ for all to receive and to know. Theirs was a job, I'm sure, with no such fine intents, but the outcome is still the same. Jesus is lifted up for all to see and to adore, ponder, sorrow, praise, or wonder. I am always reminded of the passage from the Gospel of Saint John, "and I, when I am lifted up from the earth, will draw all men to myself." It is a curious notion that such a hideous sight would be worth looking at, or attractive. This suffering man, however, draws all from whatever they are doing or thinking, and invites each person to ponder their salvation. In the traditional rites that surround the Elevation, the priest would raise the host, the bells would be rung, and the thurifer would swing the pot of sweet incense toward the elevatedhost. Here, now, God is fixed in time, and comes to us again. O Christ, our Savior, you have told us that we too must accept crucifixion if we are to accept resurrection with you. Help us to rejoice in the sufferings that come with the fulfillment of our daily duties, seeing in them the royal road of the cross to the resurrection. Amen. It was now about the sixth hour and, with the sun eclipsed, darkness came over the whole land until the ninth hour. The veil of the temple was torn right down the middle; and when Jesus had cried out in a loud voice, he said, 'It is finished. Father, into your hands I commit my spirit.' With these words Jesus breathed his last. Whenever I have seen this station, unless the stations are extremely simple, Jesus is always depicted on "an inhabited cross". Certainly the cross in inhabited by him (an interesting home!) but by two others as well. On the left is Our Lady ­ Mary who comes now to ponder the death of her son. On the right is the Beloved Disciple, John. Mother and the loved one are the ones who observe and attend to down to the very end. In the Gospel of Saint Luke, Simeon, at the Presentation of Jesus, says to Mary, "and a sword shall pierce your heart as well." I suspect there were many swords that pierced Mary's heart, swords of misunderstanding, or hatred, or disbelief, or a sense of abandonment. None of these swords, however, would match the power of witnessing her son's death. And John, what must he have been thinking, newly charged with taking care of Mary? What had been created here? I am struck that the death of Jesus is witnessed by both family and family of choice. This event is not owned by just one group, or just one family, but by the family of Jesus mother, and the family that Jesus chose. "Were you There?" the hymn asks. We can answer "yes", in the person of John, for we are members of the family of choice, the ones picked to witness this moment when a new heaven and a new earth is created. O God, who for our redemption gave your only Begotten One to the death of the cross, and by a glorious resurrection delivered us from the power of our enemy; grant us so to die daily from sin, that we may evermore live with Jesus in the joy of the resurrection; through the same Christ. Amen. When the soldiers came to Jesus, they saw that he was already dead so that they did not break his legs, but one of them opened his side with a lance, and immediately there came out blood and water. Joseph of Arimathea, because he was a disciple of Jesus (although a secret one for fear of the Jews), besought Pilate that he might take away the body of Jesus. And Pilate gave permission. I am always fascinated by the phrase that Joseph of Arimathea was a disciple "although a secret one for fear" This phrase fascinates me because I think that I saw it in so many of the deaths that occurred in the late eighties and early nineties from AIDS. I would be called to a hospital to visit a young man who at one point had been a Lutheran ­ and so I would go and begin my ministry with him. More often than not, these young men would be ministered to by their mothers, the fathers coming only at the very last moment. The fathers were parents too, "although secret ones for fear". That the body of Jesus should be entrusted to a fearful disciple is a hope for all of us. How many times have we backed away from confessing our belief, "for fear"? Many of the gay women and men that I have worked with over the years have all admitted this need to come out as Christians to their gay friends. Disciples, although secret ones! And yet it is to these "fearful" ones that the body of Jesus is entrusted. The beauty of the Gospel and of the Passion is that in them the little ones are lifted up, the marginalized are given great roles, and those that have been rejected by others are chosen. What will you do with the body of Jesus? Where will you enshrine it? Reveal it? O Jesus Christ, your death takes away the sting of death: grant to us the ability to follow in faith where you have led the way, so that we may finally fall asleep peacefully in you, and awake after your likeness; through your mercy, and in your name. Amen. When it was evening, there came a rich man of Arimathea, called Joseph, who had himself become a disciple of Jesus. This one went to Pilate and asked for the body of Jesus. Pilate then ordered it to be handed over. So Joseph took the body, wrapped it in a clean shroud and put it in a new tomb which had been hewn out of the rock. Then a large stone was rolled across the entrance of the tomb, and Joseph went away. "And Joseph went away." The report is spare. There is no grieving, no tears, no beating of the breast, no paid lamenting women; Joseph just goes away. I suspect his is not the only one who did so. Having made his honors to the body of Jesus he goes away, but so did the disciples, and all the others (excepting that very persistent Mary Magdalene). Bishop John Shelby Spong, in one of his books on reforming Christianity, talks about the Easter faith, and how it came to Peter up in Galilee. If each of them had indeed "gone away", then it was Jesus' stunning action that was indeed a surprise to each of them. There was no need to lay the body in the tomb, and then nervously wait. Jesus was doing a new thing. The story of what God does in Jesus is so out of the norm that it goes unrecognized by a great many. Mary Magdalene thinks he's the gardener. The disciples think that the women who have seen the rolled-away-stone are crazy. Thomas thinks they are all daft. All would have laid the body to rest and gone away. The Easter faith and hope grew in a seedbed removed from the body. It was nurtured in the sometimes misunderstood hope of the men and women who followed Jesus. It grew in spite of the fear that enveloped each of them as they suddenly stood on Golgotha without their Lord. It was acclaimed as the Spirit took hold and ushered in her own era. The moving part of the Great Vigil of Easter is the long, drawn-out, Liturgy of the Word in which the whole of Salvation History is retold. There is an intentional waiting that goes on. It is really a rehearsal of clues and hints, of revelations and signs. In the waiting and hearing, we begin to understand what resurrection is all about, and how it comes in our own waiting and wondering. It is good to lay our Lord to rest, go away, and wait. For we haven't yet seen all that the Resurrected One brings to us. O Jesus Christ, Only Begotten of the Living God, who (at this hour) rested in the sepulcher, and thereby sanctified the grave to be a bed of hope for your people, cause us to rise again and to live with you forever, who live and reign with the Most High and the Holy Spirit, one God, forever. Amen.